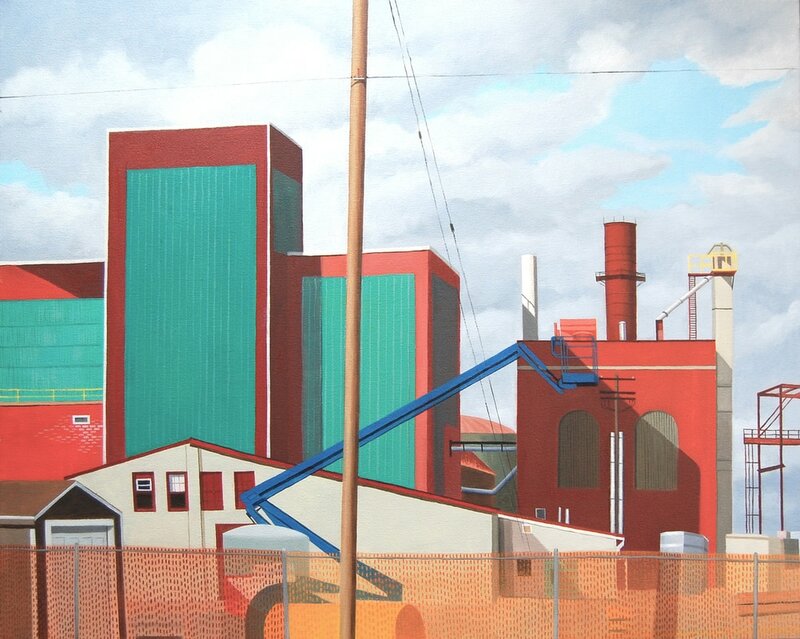 Cargill Blue Crane; Oil on canvas; 24" x 30"
My architectural paintings are of buildings, spaces and places that we tend to pass by and perhaps not notice. The subjects are the neglected corners of old warehouses, alleyways, doorways, industrial sites; the everyday, mundane places we see walking to work, driving to the store or places we catch out of the corner of our eye as we rush by that are punctuated by a beam of sunlight or attract me because they are so out of place or so much in their place. I paint the subject with simple, direct color forms, playing on the geometry of the space. Paying a great deal of attention to the architecture of the painting, I use the relationship of color and light to create a place for the subject to live and an atmosphere that attempts to recreate the original response I had to it. public permanent collections and many private collections. Ms. Zaccagni is an adjunct instructor of drawing and painting at The School of Art and Design, New York State College of Ceramics at Alfred University in Alfred, NY. She maintains a studio in Alfred Station, NY.